After initial treatment, the contours of the abdomen and flanks are improved. 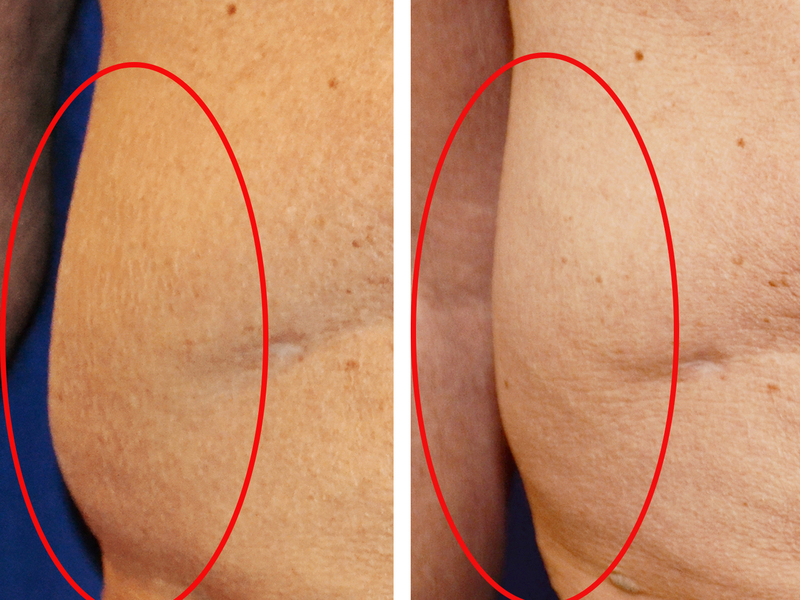 After initial treatment, the love handles are improved. After treatment, the contours of the back and flanks are improved. After treatment, the contours of the abdomen and flanks are improved. 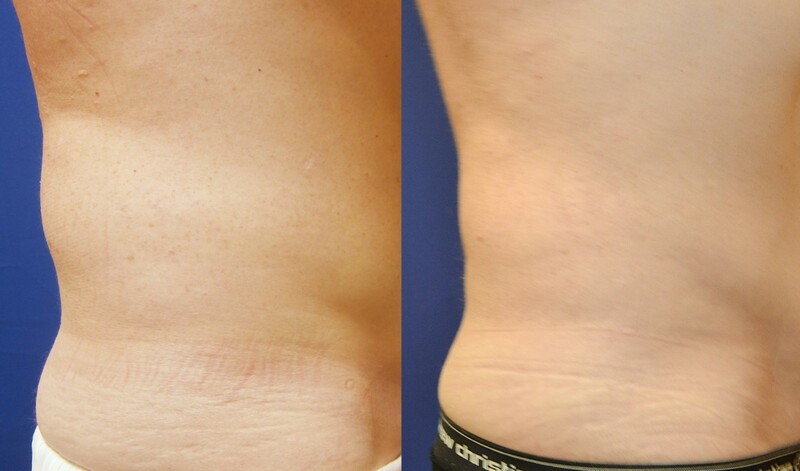 After treatment, the contours of the abdomen, flank, and back are improved. Temporal Vein is visible before treatment. After treatment, Temporal Vein is no longer visible. Dr. Cadoux removes veins with advanced foam sclerotherapy techniques, with ultrasound-guided sclerotherapy, and with special vein lasers. 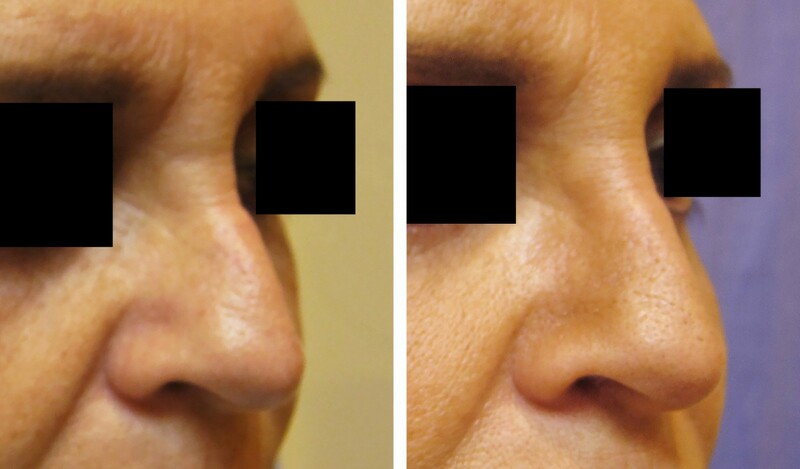 After one treatment, the patient’s lips, chin, nasolabial folds, jawline, and cheek contours are improved. The lines around the corners of the mouth and chin are substantially corrected. After one treatment, the “bagginess” of the eye has been reduced and the contours of the cheeks, nasolabial folds, and lips are improved. After one treatment, the contours of the cheek are improved, resulting in a more youthful appearance. After one treatment, the glabellar trough is filled, and the brow is re-constructed and lifted. After treatment, the brow is lifted and re-contoured, and lines are improved. After one treatment, the contours of the lips and chin are improved, giving a more youthful appearance. Dr. Cadoux uses injectable fillers that are natural to the body, long -lasting, and safe. Residual lines can be further improved with additional treatments. 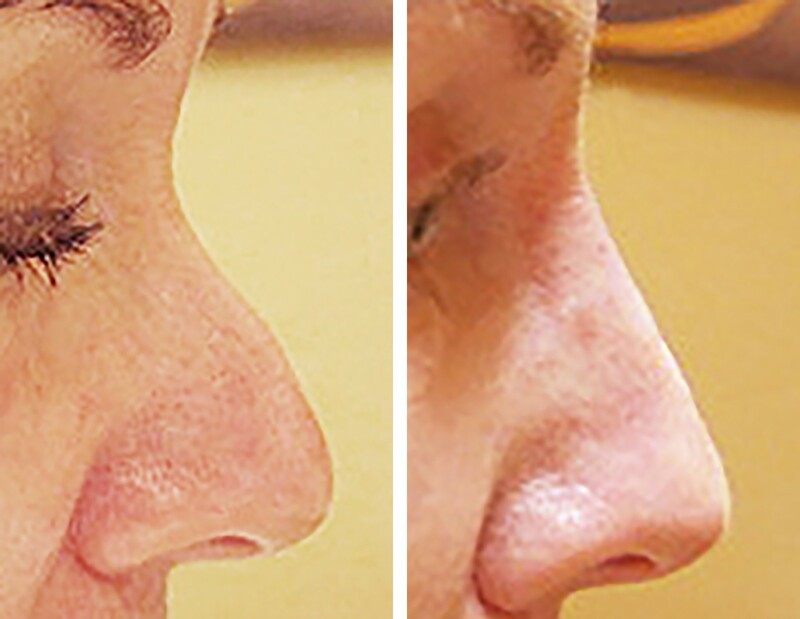 After one treatment, the bridge of the nose is modified to attain a more pleasant appearance. The results are accomplished without surgery. After treatment, the volume loss in the chin and mid-face are restored and the profile of the chin is enhanced, resulting in a more youthful appearance. Dr. Cadoux injects a filler into the cheeks and lips, resulting in a more youthful appearance. 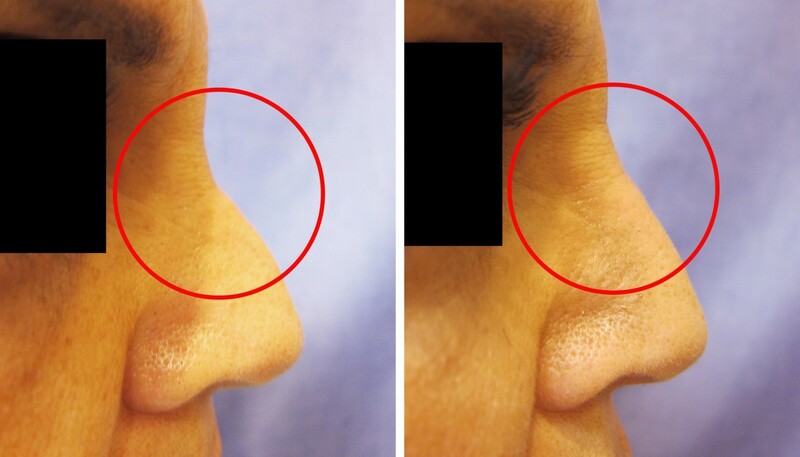 Two weeks after Botox® treatment and dermal fillers, the lines and troughs are significantly improved. Dr. Cadoux uses only full-strength, FDA-approved Allergan Botox® Cosmetic. After treatment, traumatic injury to the face is improved. After one treatment, loss of volume in the cheek and puffiness under the eye are improved. After one treatment, the upper lip is fuller and better balances the lower lip. After one treatment, the contours of the jawline, chin, and lips are improved. After one treatment, atrophy of the earlobe is improved. After one treatment, the contours of the chin, jawline and neck are improved. After one treatment, the bridge and tip of the nose are modified to attain a more pleasant appearance. After one treatment, the depression under the eye is improved. After one treatment, the contours of the jawline and chin are improved, resulting in a more youthful appearance. 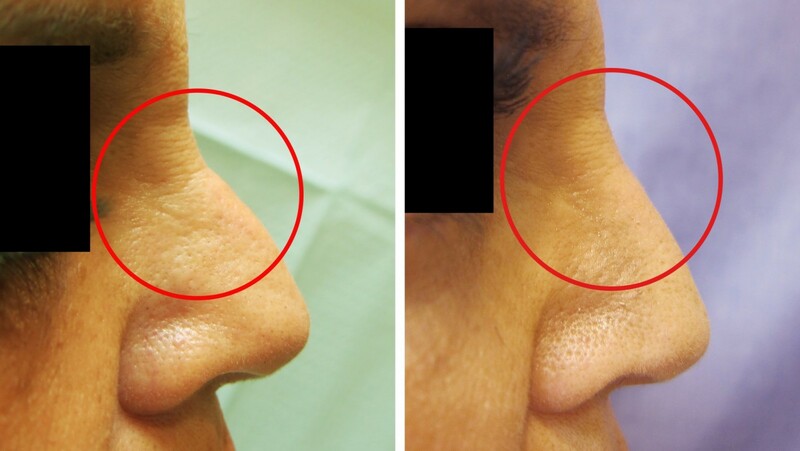 Two weeks after dermal fillers and Botox® treatment, the lines and depressions are significantly improved. 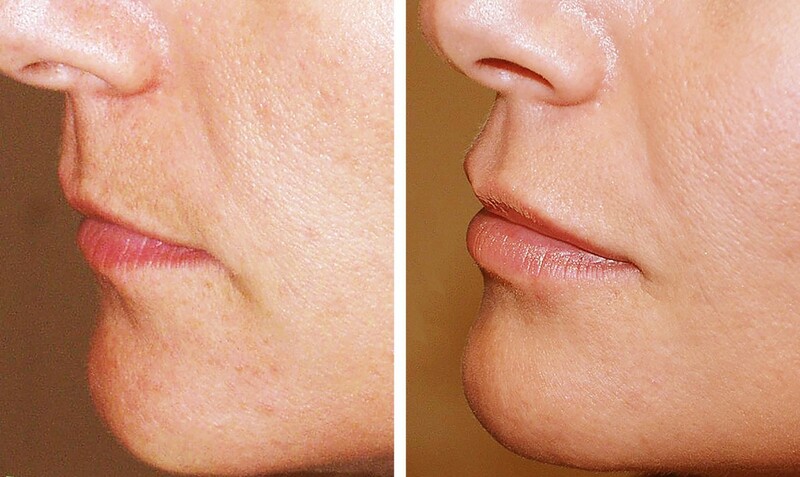 After one treatment, the contours of the chin and lips are improved, resulting in a more youthful appearance. 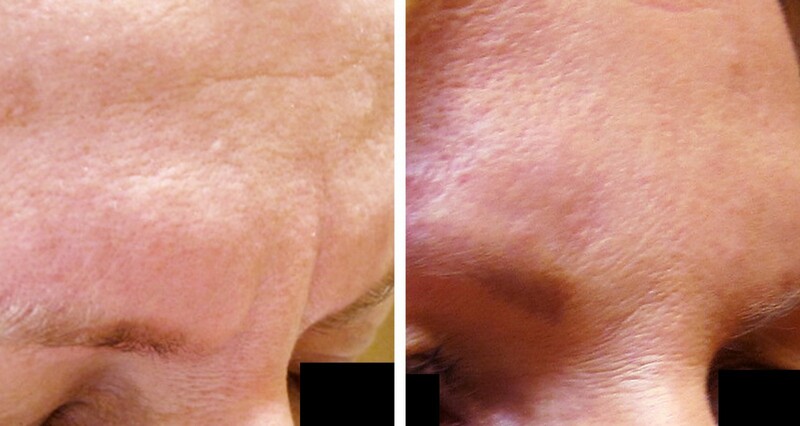 After one treatment, the midface is enhanced, restoring youthful contours. 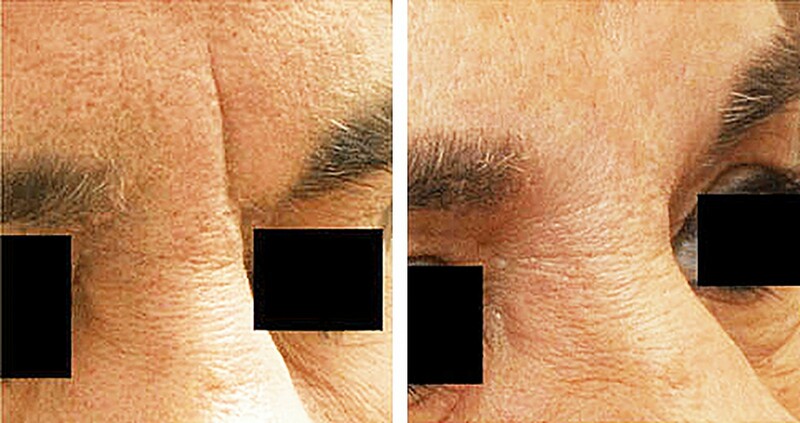 After treatment, the contours and lines are significantly improved. After treatment, the glabellar trough is filled, and the brow is re-constructed and lifted. Dr. Cadoux injects filler into the lips, chin, and facial lines, resulting in a more youthful appearance. After treatment, the contours of the cheeks, chin, and lips are improved. 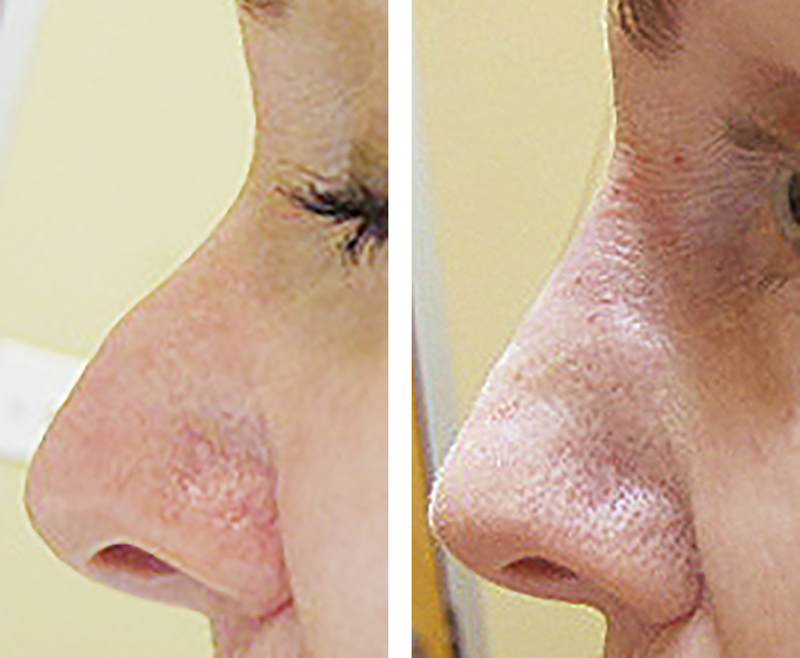 After one treatment, loss of volume in the cheek and “puffiness” under the eye are improved. After one treatment, the volume loss in the chin and mid-face is restored and the profile of the chin is enhanced, resulting in a more youthful appearance. After one treatment, the “bagginess” of the eye has been reduced. Two weeks after dermal fillers and Botox® treatment, the lines and troughs are improved. Dr. Cadoux injects a filler into the lips, chin, and cheek, resulting in a more youthful appearance. 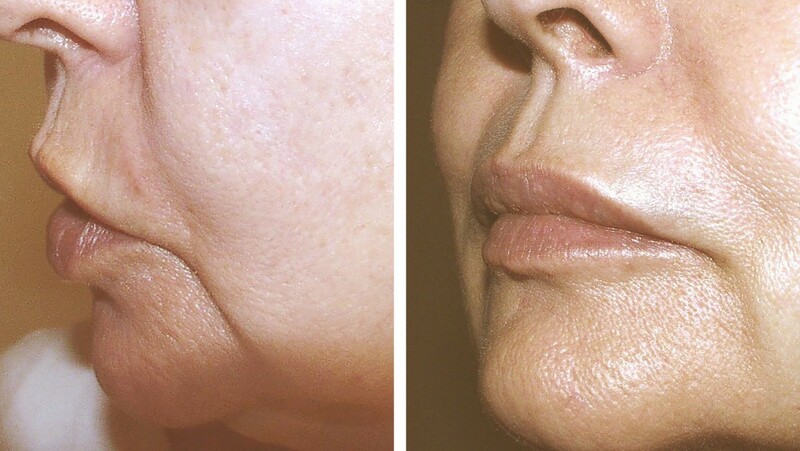 After one treatment, the contours of the lips and chin are improved, resulting in a more youthful appearance. After one treatment, the volume loss in the chin and mid-face are restored and the profile of the chin is enhanced, resulting in a more youthful appearance. 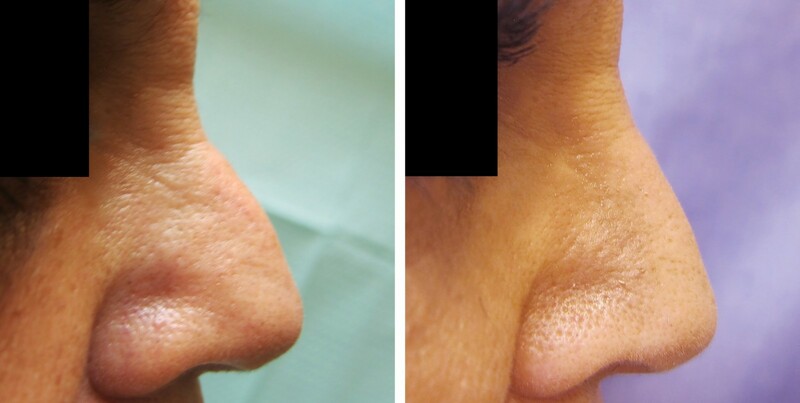 After one treatment, the contours of the nose are improved. After one treatment, the contours of the cheek, jawline, lips, and chin are improved. 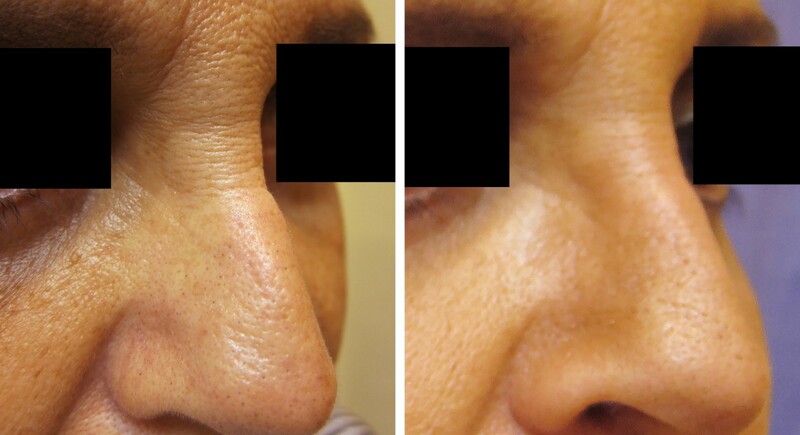 Two weeks after the first treatment, there is significant improvement in facial contours and volumes. The residual lines will continue to improve over the following several months. Two weeks after Botox® treatment and dermal fillers, the lines and depressions are significantly improved. After treatment, the contours of the chin, lips, and lines around the mouth are improved, giving a more youthful appearance. 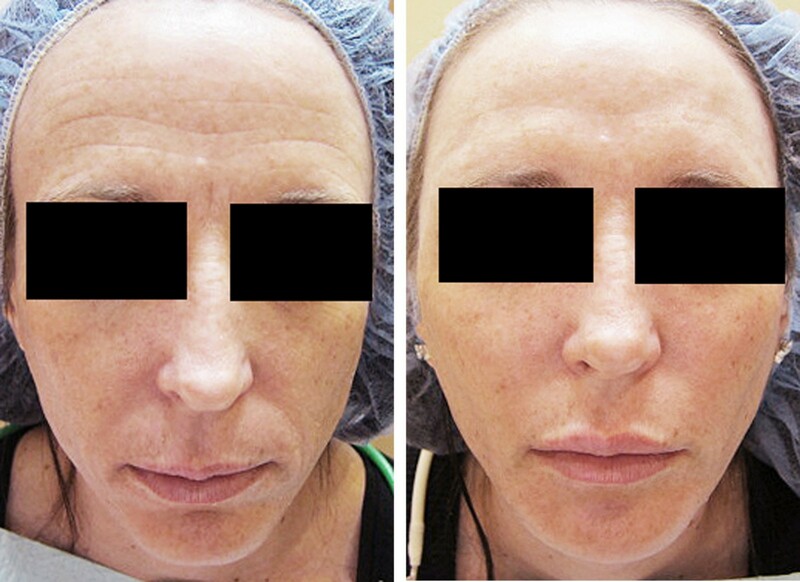 Two weeks after Botox® treatment and dermal fillers, the lines and troughs are improved. 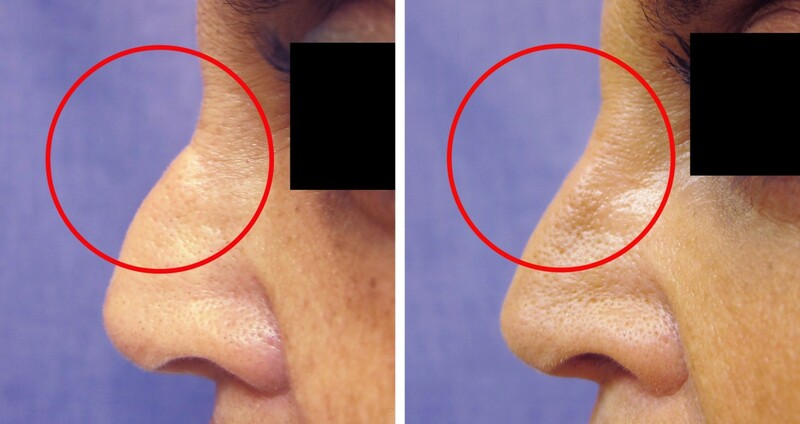 After one treatment, the contours of the chin, lips, and nasolabial folds have improved. Two weeks after treatment, there is significant improvement in the volume and appearance of the earlobe. 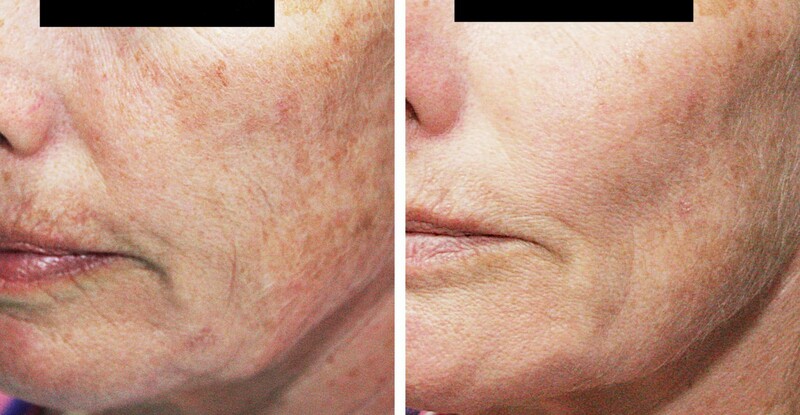 After one treatment, the chin, lips, and nasolabial folds are improved, resulting in a more youthful appearance. Two weeks after Botox® treatment and injectable implant, the deep lines between the eyebrows have been substantially improved. 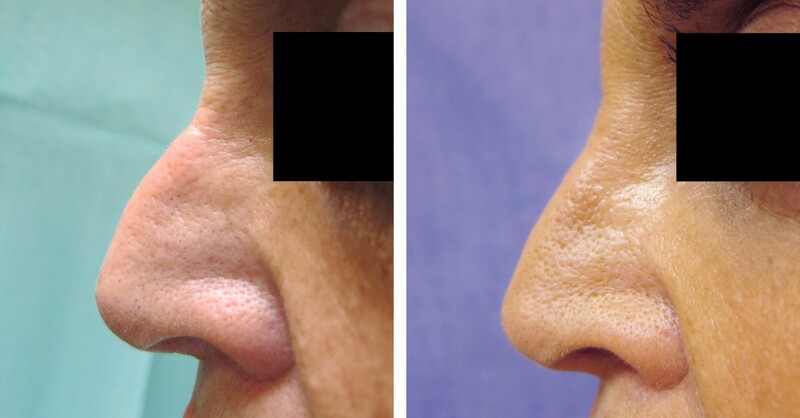 After one treatment, irregularities at the end of the nose are modified to attain a more pleasant appearance. After one treatment, the contours of the chin and lips are improved. Two weeks after fillers and Botox® treatment, the lines and depressions are significantly improved. After one treatment, the contours of the lips, chin, nasolabial fold, and cheek are improved, resulting in a more youthful appearance. After one treatment, the glabellar troughs are filled. Dr. Cadoux injects filler into the lips and chin, resulting in a more youthful appearance. After one treatment, the contours of the lips, chin, and lower face are improved. After one treatment, the contours of the chip, lips, and nasolabial folds are improved. After one treatment, the volume loss in the chin and the mid-face has been restored and the profile of the chin has been enhanced, giving a more youthful appearance. After one treatment, the chin and lips are improved. After one treatment, the contours of the cheeks, lips, and lines of the face are improved, giving a more youthful appearance. 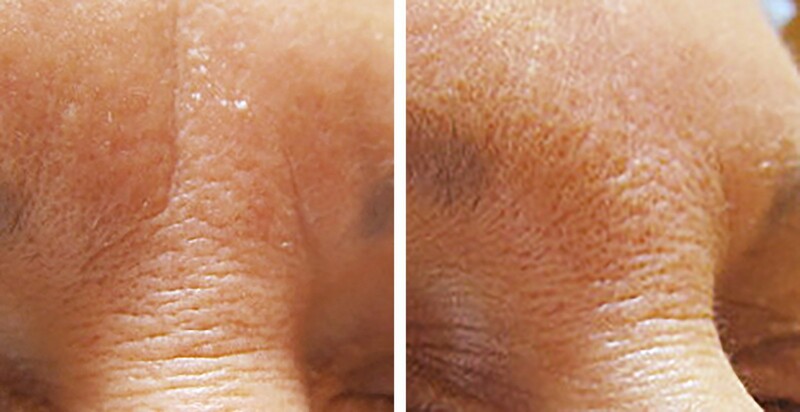 Two weeks after Botox® treatment, the lines are significantly improved. The residual lines will continue to improve over the next several months. Dr. Cadoux uses only full-strength FDA-approved Allergan Botox® Cosmetic. These lines will further improve over the next few months. Further improvement occurs with time. Further improvement in the depression will occur over time. 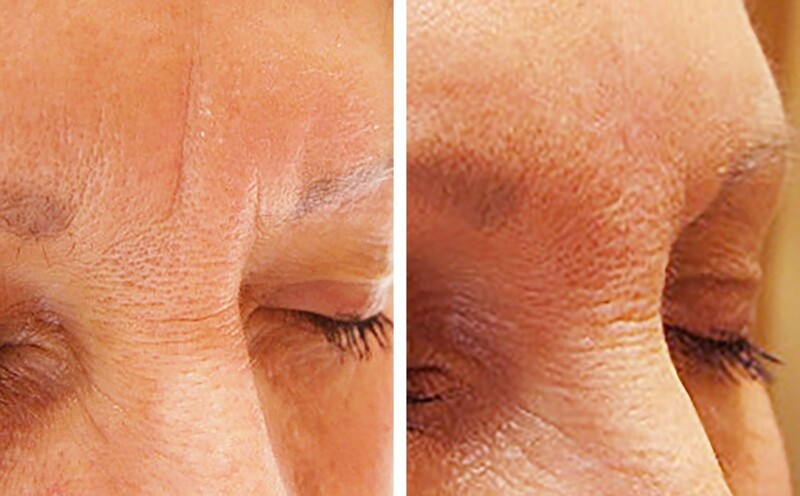 Two weeks after Botox® treatment, the lines and depressions are significantly improved. Dr. Cadoux skillfully and artistically uses to smooth away wrinkles around your mouth, nose and other areas. With just one Juvederm treatment, you’ll get smooth and natural-looking results that last up to a year or longer. Three months after Ultherapy and dermal fillers, the cheek, neck, and jawline are improved and the neck has been lifted. Three months after one Ultherapy treatment, the neck and jawline are both lifted. Further treatment will result in further lifting. 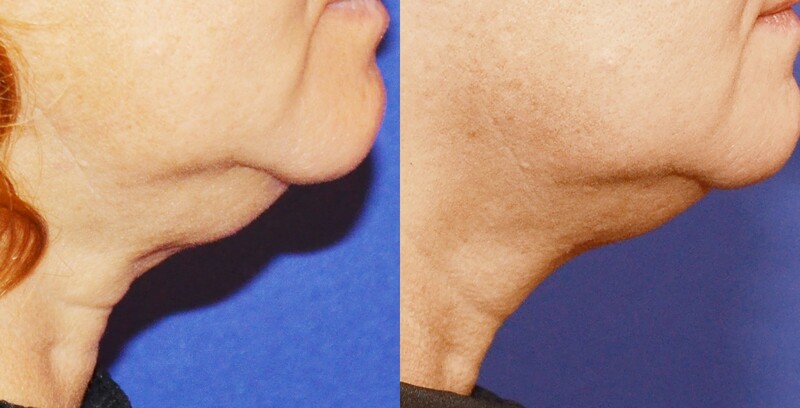 Three months after a single Ultherapy treatment, the skin of the neck is tightened and lifted, and the jawline is improved. Three months after one Ultherapy treatment, the face, neck, and jawline are all lifted. Three months after a single Ultherapy treatment, the neck and jawline are both lifted. Images depict actual patient of Greenspring Rejuvenation. 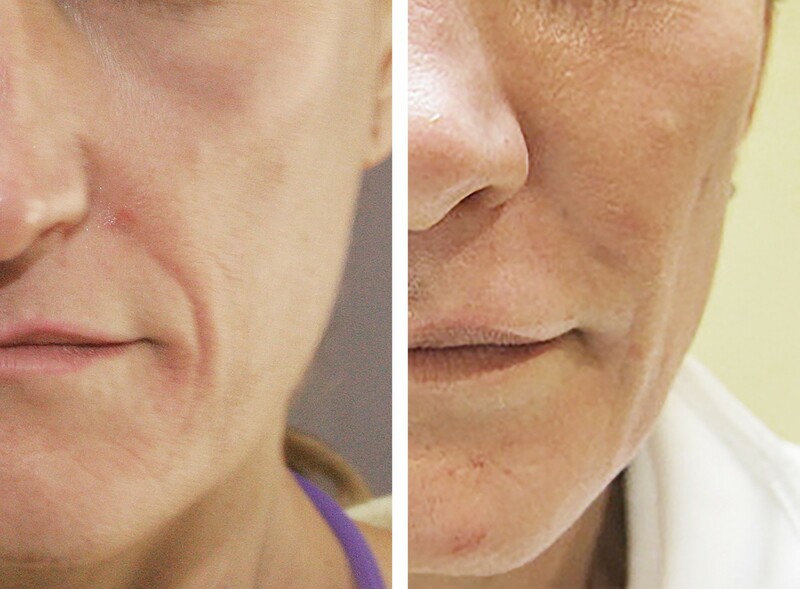 Three months after Ultherapy treatment and dermal fillers, the contours of the cheek, chin, and jawline are improved. The face and neck have been lifted. Three months after one Ultherapy treatment, the neck is lifted, the skin of the neck is tightened, and the jowls and jawline are improved. 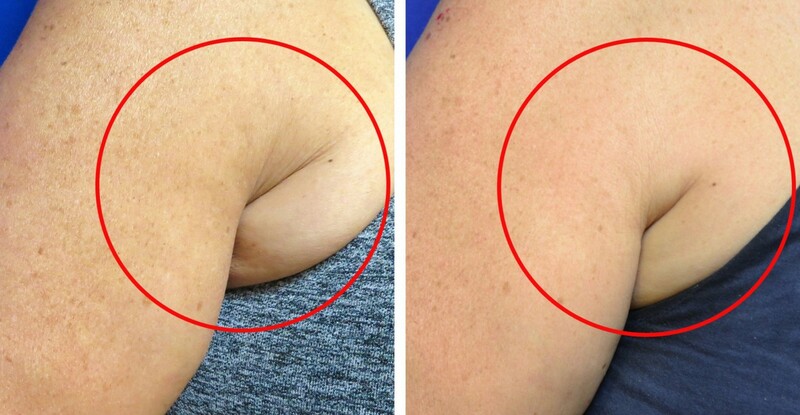 After VASERshape treatment, the skin is tightened and the fat in the chest and armpit area is reduced. Additional treatment will result in further improvement. 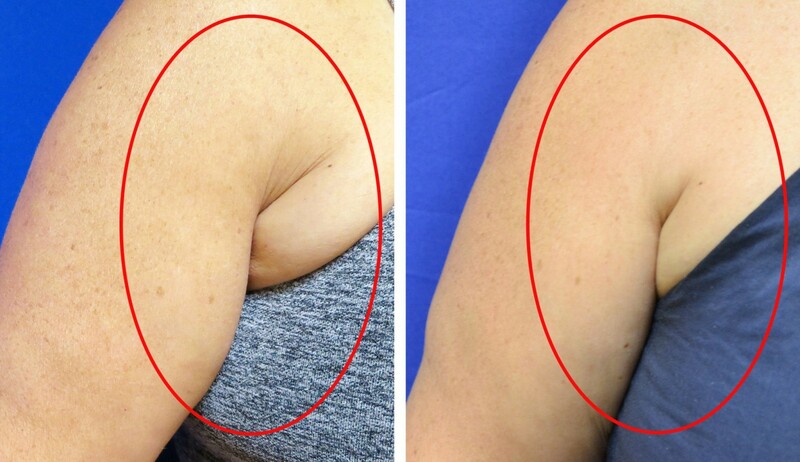 After VASERshape treatment, the skin is tightened and the fat under the arm and chest is reduced. 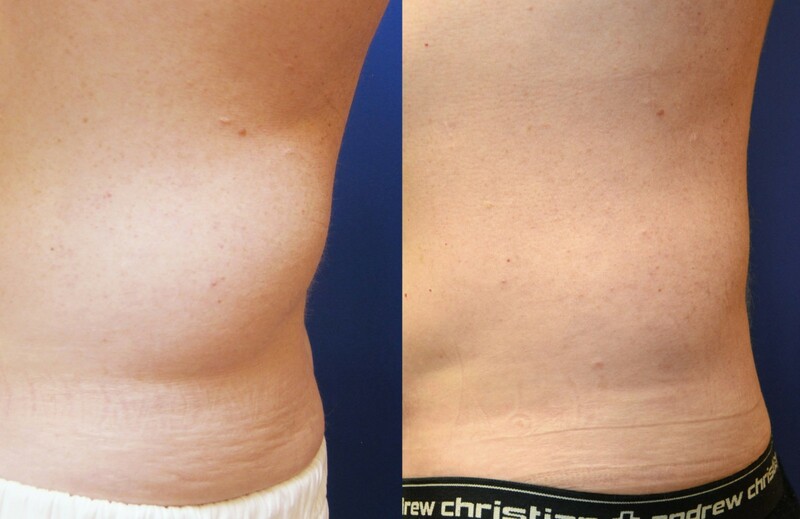 CoolSculpting is a non-surgical fat-reduction treatment that uses controlled cooling to eliminate stubborn fat. The results are proven, noticeable, and lasting – so you’ll look great from every angle. in the thighs and buttocks by releasing the tethered fibrous bands that create the dimple. Further treatments will result in further improvements.